Most of us at some stage of life find ourselves downsizing, simplifying or needing to change. 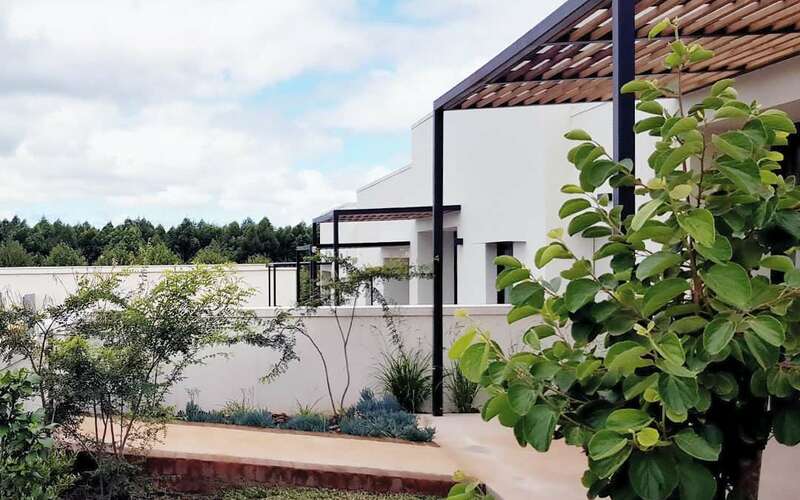 My own life partner had just died when I was asked to design the Karoo Townhouses and my planning approach was a very personal one. I imagined I needed to give up my home and move into spaces in which I could still have my most significant and liveable pieces. I would take my Chesterfield two-seater couch, two contemporary really comfortable chairs and the coffee table, so 4 people could happily drink tea or wine and converse together. There would be a round dining table and 4 chairs that could stretch to seat 6, as I love to cook for friends. My tall hold-all cupboard, my desk to organise life from and a work chair. In the bedroom I would be able to have both my military chest and my grandmother’s tall boy. So there it was, I had designed the smallest unit to take just that and no more together with my favourite pieces of art, books, music and TV. Looking out is really important growing older or more infirm, so the windows and doors are big. There is a wonderland of bird and plant life in a planted garden or the comings and goings of neighbour’s in the street that can engage one. You can never anticipate exactly what will need to change in one’s life, but adaptability is key. I aim for my houses to live well, be filled with light, be simple yet contemporary in their understatement, allowing a calm backdrop to each owner’s most precious possessions. That’s how the designs happened, and I would be happy to move in! There is only 1 Karoo Townhouse still available.